The Wayne County Board will meet tonight at 7, and a possible intergovernmental agreement with the Egyptian Health Department is on the agenda. Egyptian is based in Eldorado, and it recently posted a job opening on its website for an office manager in Fairfield. Egyptian offers similar services as Southeastern Illinois Counseling Center did before it closed last month. 26-year-old Bobby L. Powell was arrested yesterday on charges of domestic battery and aggravated assault. Police reports indicate Powell threatened multiple people with a kitchen knife and pushed a female to the ground during an incident yesterday morning. He was transported to the Wayne County Jail and held, pending the posting of bond. 37-year-old Kindra L. York recently pleaded guilty to a count of possession of less than five grams of methamphetamine in Wayne County Circuit Court. She was sentenced to 24 months special section probation, 30 hours of public service, and time served. She was also ordered to pay fines and court costs. Robbe Greenwood is the winner of two tickets to Blake Shelton’s 2019 Friends and Heroes Concert. WFIW/WOKZ received the tickets prior to the opening day of ticket sales tomorrow, and Greenwood was entered into a drawing by accessing the YouTube version of our “Morning Coffee” program, which airs each weekday between 8 and 9 a.m. The Wayne County Circuit Clerk’s Office would like to remind the public that the courthouse will be closed Monday in observance of Veterans Day. No payments will be accepted at the courthouse on Monday, though online payments will still be accepted. Crossville Communications has announced that they will be the drop off point once again for Toys for Tots this year. Anyone who would like to contribute is asked to bring new and unopened toys, or a cash donation, to the office in Crossville. All contributions will stay in Edwards, Wabash, Wayne, and White counties. Last year, over 1,700 local families received contributions from the Toys for Tots campaign. Veterans Day services in Fairfield will be held at 11 a.m. on Sunday at the Veterans Section of Maple Hill Cemetery. Elmer McDuffee will be the event’s Master of Ceremonies, JC McDuffee will provide the opening prayer, and Jeremy Vaughan will be the featured speaker. In the event of inclement weather, the service will be held upstairs in the American Legion. Y-Fairfield met earlier this week to discuss their upcoming Chili Cook-Off at the Fairfield Elks, which is scheduled for November 17th. The group is still accepting chili entries. Entry for the event will start at $5, though that amount will increase to $10 as the musical events approach. Local product Jorji Demarat and Mountain King are the two acts expected to perform on the night. 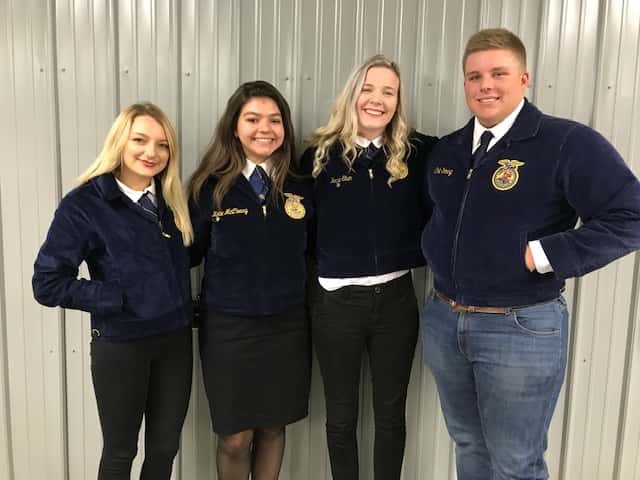 The Fairfield FFA recently participated in a Section 23 Agricultural Sales competition at Wabash Valley College. Fairfield placed 2nd as a team, with Cadie Devous taking home 5th place individual honors. Katie McCleary, Austin Holtgrave, and Kenna Stum also participated in the event. Pictured from left: Cadie Devous (5th place individually), Katie McCleary (8th place), Kenna Stum, and Austin Holtgrave (12th place). The Fairfield Park District’s monthly meeting, originally scheduled for tonight, will be pushed back to Tuesday evening at 6 due to a lack of a quorum. The fate of the Kon-Tiki could once again be discussed, though Board President Jay Fyie says he is still awaiting word on an appraisal for the building. The district discussed the possibilities of selling or tearing the structure down at their meeting last month. Frontier Community College is offering a Snowman Table Runner workshop on Saturday from 9 a.m. to 2 p.m. as the first of its Christmas workshops. After Saturday, the next date will be for a Gift Wrapping workshop on Monday, December 3rd. To sign up for either workshop, call FCC at 842-3711, or visit the Student Services office between 7:30 and 4:30 on weekdays. Classes are filled on a first-come, first-serve basis. University of Illinois officials are planning to seek a 16.5 percent state funding boost to make up for money lost from the state’s long budget standoff. University officials say the system received only about 28 percent of its typical state funding two years ago, and that shortfall has yet to be replenished. Roughly two-thirds of the proposed funding increase would go to pay raises and faculty retention and recruitment. Bruce Rauner’s fate was sealed very early Tuesday night, as he lost to Democrat JB Pritzker in the gubernatorial race. However, though he was soundly defeated in his re-election bid, Rauner believes it is still possible to make changes to the legislative remapping process, if Democrats are willing. That belief stems from other states around the country accomplishing the same goals, thanks to bi-partisan support. River stages as of this morning: Little Wabash, east of Fairfield stands at 22.08 feet, above the 17 ft. flood stage. Meanwhile, the Skillet Fork at Wayne City has a reading of 7.63 feet (flood stage is 15 ft.). The Little Wabash below Clay City is at 17.68 feet (flood stage is 18 ft.).